Damien Gayle (THE DAILY MAIL) – With Christmas, sales of chocolate gold coins no doubt soared as parents filled their little ones’ stockings with edible treasure. But wealthy individuals worried about what the New Year could bring are instead stocking up on gold chocolate bars. Swiss refinery Valcambi has been selling its CombiBar in Switzerland, Austria and Germany to private investors who are worried about a return of Weimar Republic-style hyperinflation. 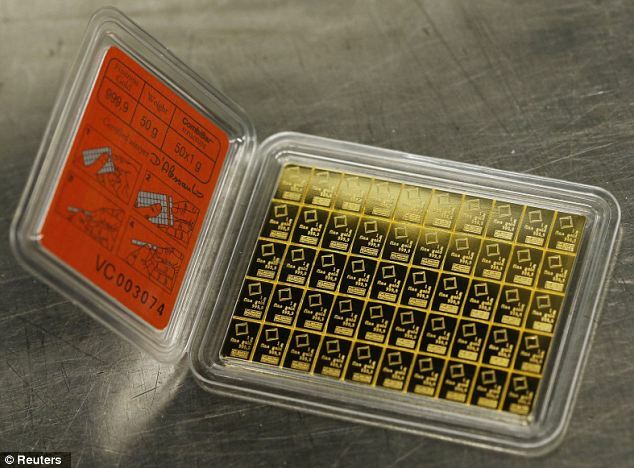 The size of a credit card, the 50g gold CombiBars are easily be broken into one gram pieces that can be used as money in times of crisis. Now the company wants to bring the gold bars to market in America and build up sales in India – the world’s largest consumer of gold, where it has long served as a parallel currency. Roger Sayles, From Sovereign to Serf (SERFS-UP.NET) – Gold chocolate bar: The gold Combibar is dubbed a ‘chocolate bar’ because gold pieces can be easily broken off by hand. Investors worried that inflation and financial market turmoil will wipe out the value of their cash have poured money into gold over the past decade. Gold prices have gained almost 500 percent since 2001 – compared to a 12 percent increase in MSCI’s world equity index, a benchmark for the value of the world’s business investments. Sales of gold bars and coins were worth almost $77billion (£48billion) in 2011, up from just $3.5billion (£2.2billion) in 2002, according to data from the World Gold Council. “The rich are buying standard bars or have deposits of physical gold. People that have less money are buying up to 100 grams,” said Michael Mesaric, CEO of Valcambi. Mesaric said the advantage of the CombiBar – dubbed a ‘chocolate bar’ because pieces can be easily broken off by hand – is that it is easily carried and is cheaper than buying 50 one gram bars. “The produce can also be used as an alternative method of payment,” he said. Valcambi, a unit of U.S. mining giant Newmont, is building a sales network in India and plans to launch the CombiBar on the U.S. market next year. In Japan, it wants to focus on CombiBars made of platinum and palladium. In Europe, demand is particularly strong among the Germans, still scarred by post-World War One hyperinflation, when money became all but worthless and it took a wheelbarrow full of notes to buy a loaf of bread. The CombiBar is particularly popular among grandparents who want to give their grandchildren a strip of gold rather than a coin, said Andreas Habluetzel, head of the Swiss business of Degussa, a gold trading company. Some fund managers, however, remain skeptical. Stephan Mueller, who manages bank Julius Baer’s $6billion gold fund, said one problem with using gold as a method of payment is that people have to take its value on blind trust. “Sales rise according to the temperature of the crisis,” said Thomas Geissler, whose firm Ex Oriente Lux operates 17 gold vending machines in Europe, the U.S. and the United Arab Emirates. Since the launch of the machines, which operate under the name ‘GOLD To Go’, 50,000 customers have withdrawn more than 21million euros in gold. The average buyer is male, over 50 years old and well-off. “Customers are hoarding gold mostly at home as a precaution against a crisis, just as their fathers and grandfathers did before them,” Mr Geissler said.